A small molecule antiviral compound has been shown to protect rhesus monkeys against lethal Ebolavirus disease, even when given up to three days after virus inoculation. The compound, called GS-5734, is a nucleoside analog. After uptake into cells, GS-5734 is converted to a nucleoside triphosphate (illustrated, bottom panel) which is incorporated by the viral RNA dependent RNA polymerase as it copies the viral genome. 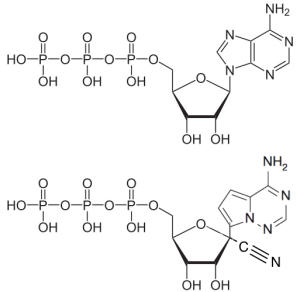 However, the nucleoside is chemically different from ATP (illustrated, top) and no further nucleotides can be incorporated into the growing RNA strand. RNA synthesis ceases, blocking production of infectious virus particles. In cell culture GS-5734 inhibits viral replication at micromolar concentrations, in a variety of human cell types including monocyte-derived macrophages, primary macrophages, endothelial cells, and a liver cell line. The drug inhibits replication of several strains of Zaire ebolavirus, including Kikwit and Makona (from the West African outbreak); Bundibugyo ebolavirus, and Sudan ebolavirus. It also inhibits replication of another filovirus, Marburg virus, as well as viruses of different families, including respiratory syncytial virus, Junin virus, Lassa fever virus, and MERS-coronavirus, but not chikungunya virus, Venezuelan equine encephalitis virus, or HIV-1. The RNA dependent RNA polymerase of Ebolaviruses has not yet been produced in active form, so the authors determined whether GS-5734 inhibits a related polymerase from respiratory syncytial virus. As predicted, the compound was incorporated into growing RNA chains by the enzyme, and caused premature termination. Typically tests of antiviral candidates begin in a small animal, and if the results are promising, proceed to nonhuman primates. While a mouse model of Ebolavirus infection is available, the serum from these animals degrades GS-5374. Consequently a rhesus monkey model of infection was used to test the compound. After intravenous administration of GS-5374, the NTP derived from it was detected in peripheral blood mononuclear cells, testes, epididymis, eyes, and brain within 4 hours. All 12 monkeys inoculated intramuscularly with Zaire ebolavirus died by 9 days post-infection. In contrast, all animals survived after administration of GS-5374 2 or 3 days after virus inoculation. These animals also had reduced virus associated pathology as measured by liver enzymes in the blood and blod clotting. Viral RNA in serum reaches 109 copies per milliliter on days 5 and 7 in untreated animals, and was undetectable in 4 of 6 treated animals. It is likely that resistant viruses can be obtained by passage in the presence of GS-5734; whether such mutant viruses emerge early in infection, and at high frequency, is an important question that will impact clinical efficacy of the drug. The authors did not detect changes in the viral RNA polymerase gene that might be assoicated with resistance, but further work is needed to address how readily such mutants arise. These promising results have lead to the initiation of a phase I clinical trial to determine whether GS-5734 is safe to administer to humans, and if the drug reaches sites where Ebolaviruses are known to replicate. However, determining the efficacy of the compound requires treatment of acutely Ebolavirus infected humans, of which there are none. It might be of interest to determine the ability of GS-5734 to clear persistent virus from previously infected individuals. You can bet that GS-5734 has already been tested for activity against Zika virus. please anyone can tell about the article above mentioned?